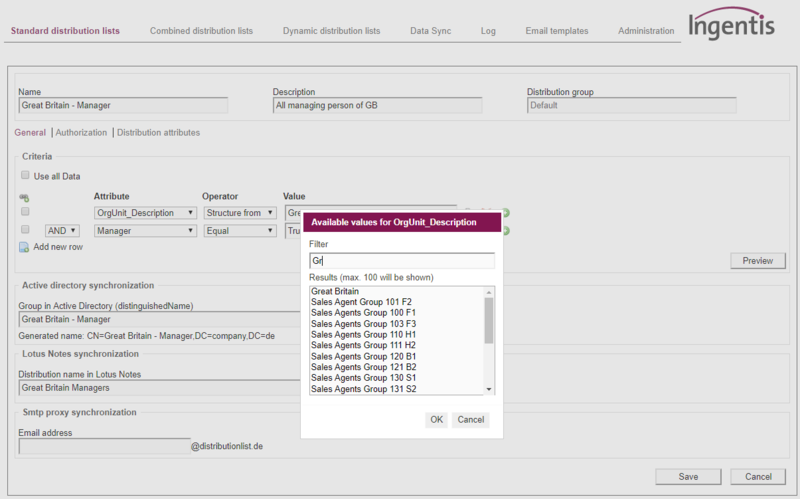 Ingentis distribution.list is an easy to use solution for the automated management of dynamic distribution groups and security groups. The members of a dynamic group are determined based on custom conditions which can easily be configured according to your requirements. The dynamic distribution groups can be synchronized with leading systems such as Active Directory, Exchange or IBM / Lotus Notes. Ingentis distribution.list closes the gap between leading data sources such as your HR system and your Active Directory, IBM / Lotus Notes or other target systems. Data that has been newly added to the source system is regularly transferred, e.g. on a daily basis. This applies to a user’s master data as well as their structural assignment. 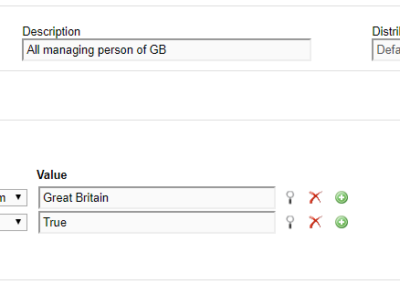 After applying the custom conditions, the updated groups can be synchronized with your target system. This ensures up-to-date groups which can be used as E-mail distribution lists, as security groups or as universal groups. 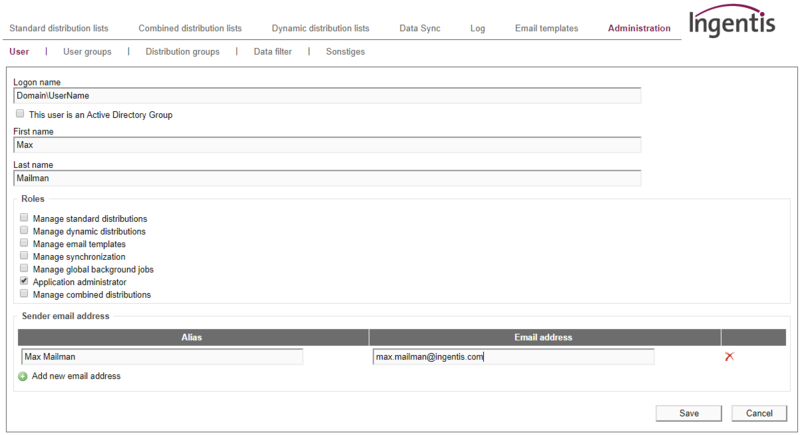 Thanks to standard interfaces, Ingentis distribution.list can easily be connected to numerous data sources. This includes leading HR systems such as SAP HCM, SAP SuccessFactors, Oracle HCM, PeopleSoft, or Workday. For example, a high-performance functional module can retrieve information from SAP HCM PA, or data about the organizational structure from SAP HCM OM in a swift manner. With its own implementation guide (IMG), this module can be adapted to the needs of your company. 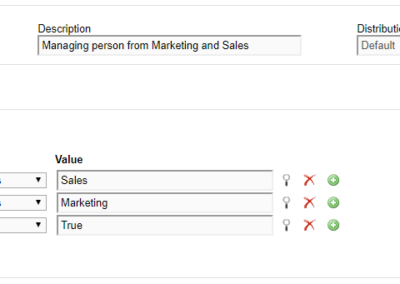 In this way, individual information types or fields can be read and used as selection criteria within distribution.list. Ingentis distribution.list can also be linked to databases (e.g. Microsoft SQL Server), directory services (e.g. LDAP / Active Directory) or flat files such as Excel, or CSV. Distribution lists created with Ingentis distribution.list can be synchronized automatically and time-controlled with your existing Active Directory or mailing system. Interfaces are available for MS Exchange/Outlook, Active Directory and Lotus Notes. Furthermore, the groups can be exported into a CSV file. 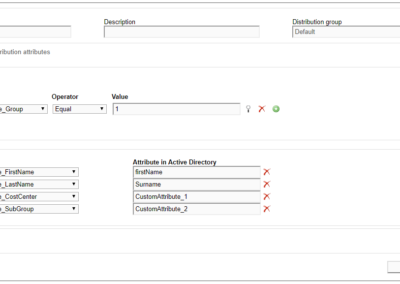 Ingentis distribution.list automatically synchronizes the most recent version of your distribution groups with Active Directory. 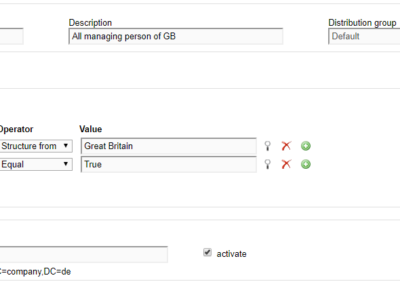 Settings that define how the software handles empty distribution groups or not yet existing ones can be freely configured. This includes the possibility of setting or changing the type from e.g. universal group to mail-enabled group. 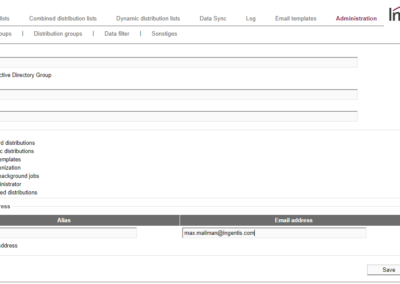 Ingentis distribution.list automatically synchronizes the most recent version of your distribution group with IBM / Lotus Notes. distribution.list takes care of the common 32k error and integrates the members into subgroups in case of large groups with many members. Our software also supports the creation and management of ACL groups. 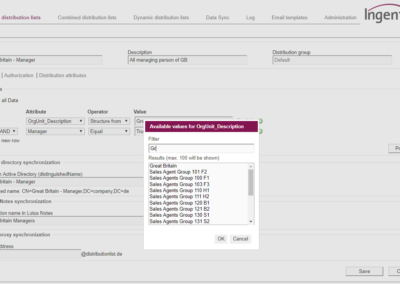 With Ingentis distribution.list, it’s possible to export the updated distribution groups into flat files such as CSV or XML. These files can be used in other target systems such as identity management systems. 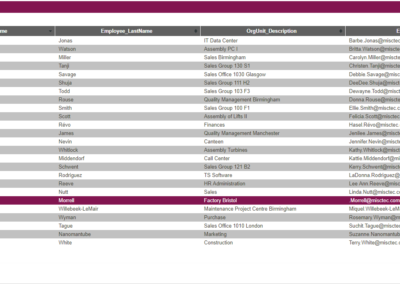 Ingentis distribution.list identifies the group members based on configurable conditions. Users matching the pre-defined criteria are added to the membership list. The dynamic criteria can be configured without any coding skills required, hence also enabling users outside of the IT department to be in charge of such task. Does your IT department still update HR data manually in the Active Directory? 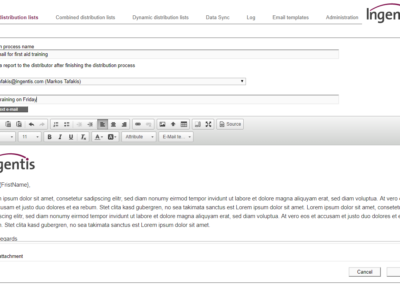 Ingentis distribution.list carries out this task automatically. All you need to do is define which attributes of the Active Directory must be updated – distribution.list will do the legwork. Examples of such attributes include department, position, building or project team of the respective group. 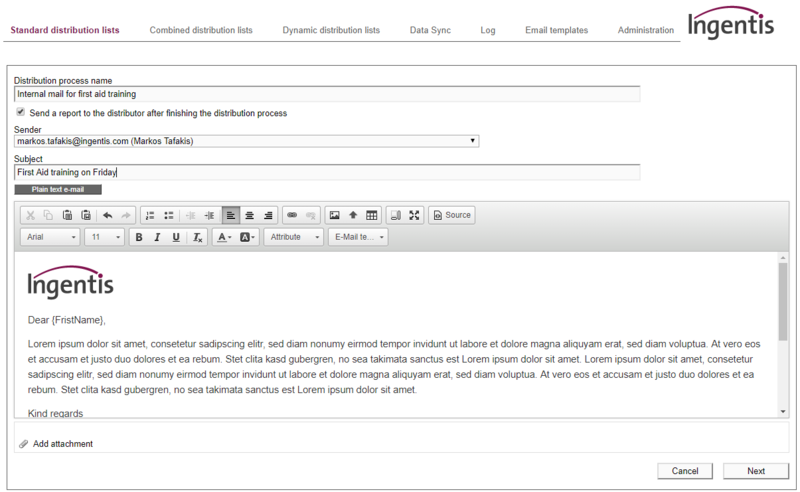 Launch your email distribution directly out of Ingentis distribution.list. Similar to your standard mailing software, you can freely edit subject line, content and attachments. Furthermore, the use of individual email templates allow for quite some freedom of design, e.g. to comply with your company’s corporate identity guidelines. The mail merge function enables a personalized client correspondence. Thanks to the email correspondence archive via online protocol the delivery of your emails can be verified. 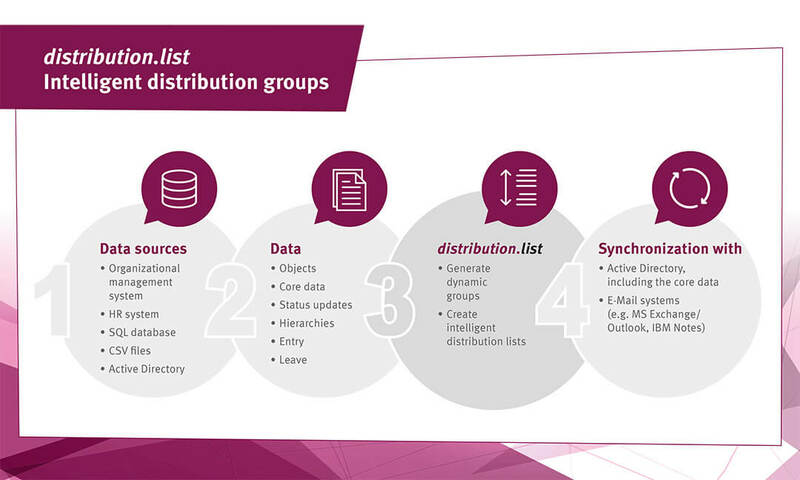 Each dynamic distribution group created with Ingentis distribution.list can be made accessible via E-mail address. Mailings can be sent to these distribution groups with the existing E-mail client – without having to synchronize with the E-mail system. This approach minimizes the number of groups in your Active Directory and the number of memberships of each user. The web-based application can be accessed by Internet browser and comes with its own user management. The user management enables a detailed configuration of features as well as access authorization for data and actions available to each user. Ingentis distribution.list comes with a PowerShell plug-in that can trigger custom scripts based on an event reported by distribution.list. This ensures the tailored behavior of Ingentis distribution.list according to the requirements of the IT department. As a result, the generated distribution list contains Emily Parker (HR), Sandra Williams (HR), and Jake Johnson (IT). But now, Jake Johnson has transferred to the finance division, and this information is updated in the database during the day by the HR department. During the next synchronization cycle, Ingentis distribution.list automatically adjusts the recipients, leaving only E.Parker and S.Williams on the list. After selecting the building, distribution.list creates a list of everbody sitting in building A. Experience the flexibility of our software solution Ingentis distribution.list in one of our online product demos. Get a free trial version – contact us! Would you like to see for yourself how distribution.list works? Get in touch with us for a free trial version. Do you have any questions regarding Ingentis distribution.list? Are you interested in a consultation? Don’t hesitate to contact us via the contact form below. We look forward to you hearing from you!